The Haunted Carousel was conceived as a piece for band utilizing the sound of a theremin, an electronic instrument often used in classic science fiction and horror movies. The part is completely optional and all critical material is doubled with other instruments of the band. The theremin part is designed to be performed live on an amplified iPad with the GarageBand application. The iPad can be amplified via the headphone jack with a guitar or keyboard amplifier. The part was composed to be playable by a confident middle school student with a background in piano or mallet keyboard. The student performs the part by sliding his/her finger along a virtual piano keyboard, creating the effect of a Theremin. 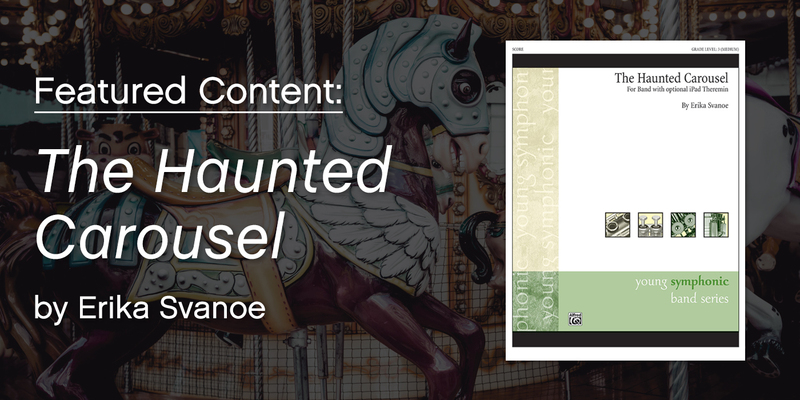 The Haunted Carousel was the winning composition in the 2014 National Band Association Composition Contest for Young Bands. Our friends at Alfred Music both co-sponsored the contest and published the piece. Experience the Haunted Carousel – and the entire SmartMusic library – for free!